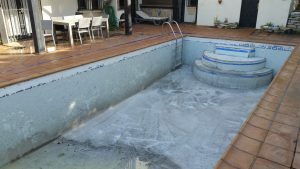 A common complaint of our customers is that their pools are too deep. This is something that can easily be rectified as part of the reform project. 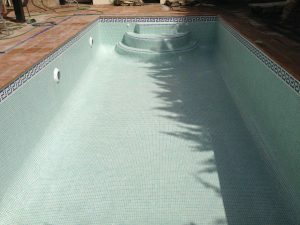 Very deep pools are most often found in older houses, built in the 60’s, 70’s and 80’s. 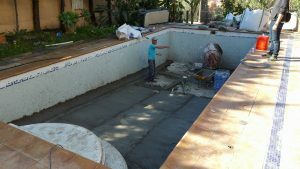 Making a swimming pool shallower has several benefits, in both comfort and practicality. It can be seen to be safer if the majority of people can keep their head out of the water. It is more enjoyable playing games in the pool if everyone can stand up. 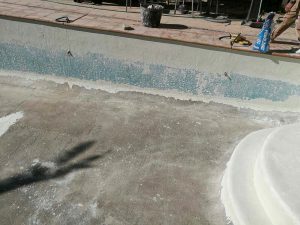 The pool will warm up faster if it is shallower. 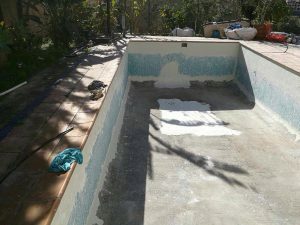 Water bills will be less when the pool is filled. Running costs are less, as less volume of water to treat with chemicals. Future maintenance bills should be less with less square meters of tiles. The process of reducing the depth is to first ensure the drain is raised up correctly, using proper fittings. 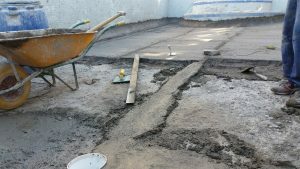 Any areas where the new concrete will meet old tiles, these must be stripped back to allow the new concrete to join the old. 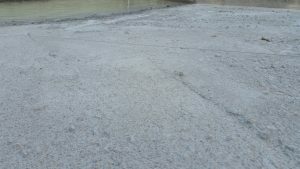 Once this work is done, concrete can be poured to raise the level. After this sets, we can render the floor to make the appropriate levels. 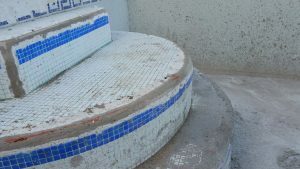 Once all the levels are correct in the base of the pool, the entire structure is skimmed with render to provide a uniform surface for the new tiles. 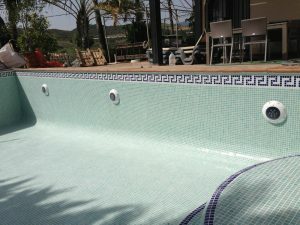 The pool is tiled using adhesives especially for swimming pools. These adhesives have additives in them that allow them to stay under water without breaking down and cope with chemicals. 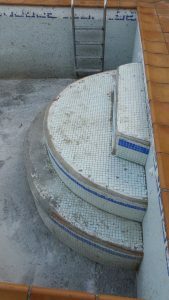 The final stage is to grout the tiles and install new cosmetic pieces where needed. 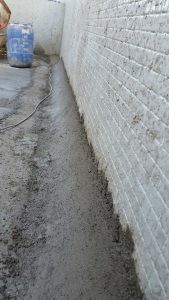 The entire renovation normally takes about a week for a team of our builders. 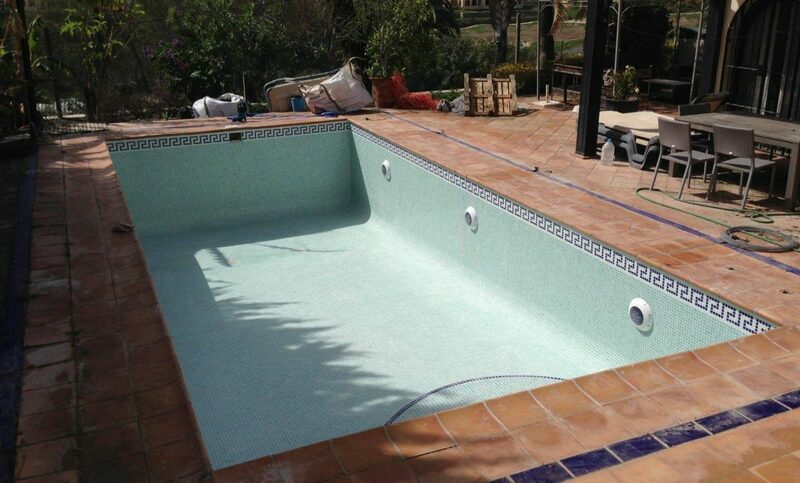 Nearly 20 years of experience offering a complete building service on the Costa del Sol and Inland. 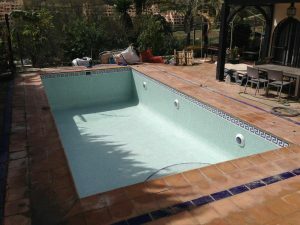 Construction work and renovation of interiors, exteriors, landscaping, and swimming pools to build the house you dream of in a timely manner and on budget.